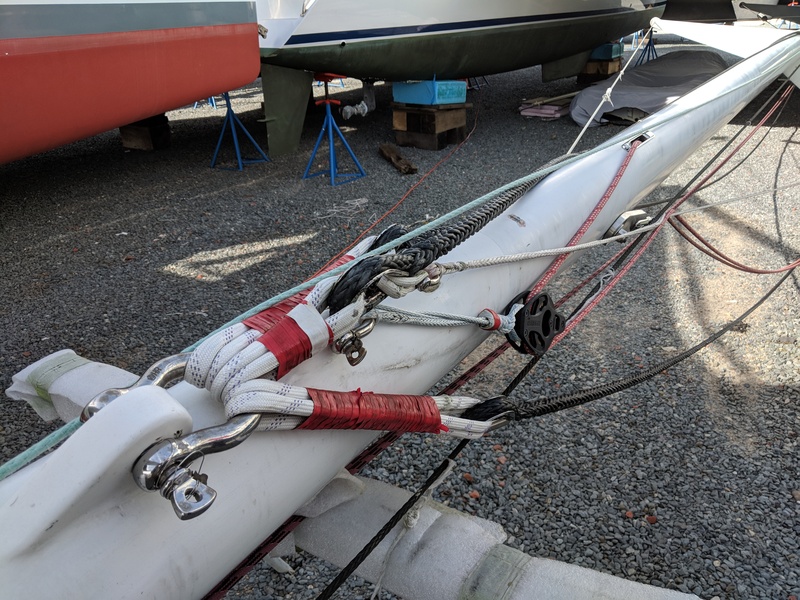 2018 was an odd year for my power trimarans. Two customers insisted on the amas being hidden if not all the time, at least in the harbor. They claimed trimarans are ugly but they wanted the benefits. 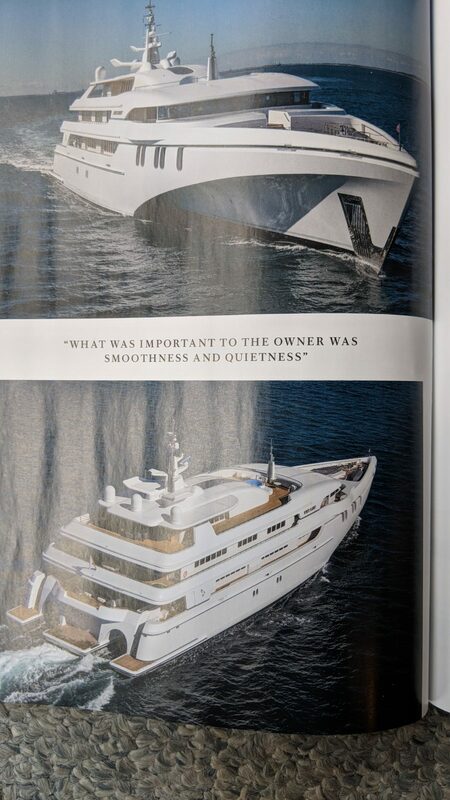 I found a concurring opinion in Boat magazine, a glossy megayacht monthly. 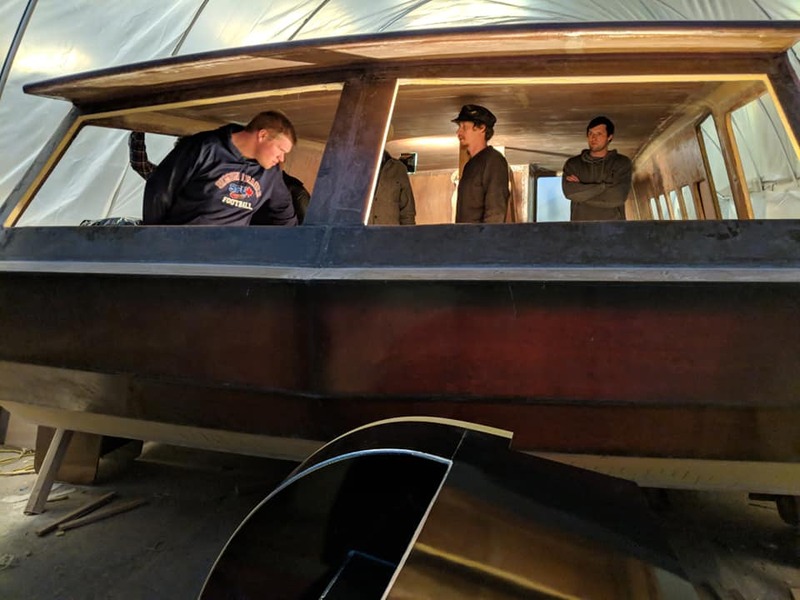 In an article on White Rabbit, a 275′ x 66′ “trimaran” they write about trimarans, “some people might not like the look of them.” As you can see in the Boat picture, it has pretty well hidden the amas. 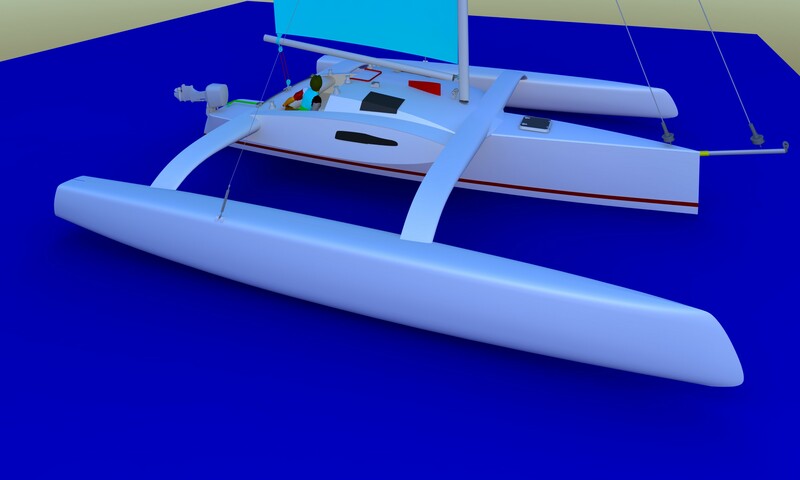 I would put it in the stuff done wrong folder, by gold plated design office who has never done a trimaran before. My first one was a trawler in Estonia where it needed the stability and economy of a trimaran, but the amas must be as invisible as possible. It had so much volume that they had to be big enough. Job ended. 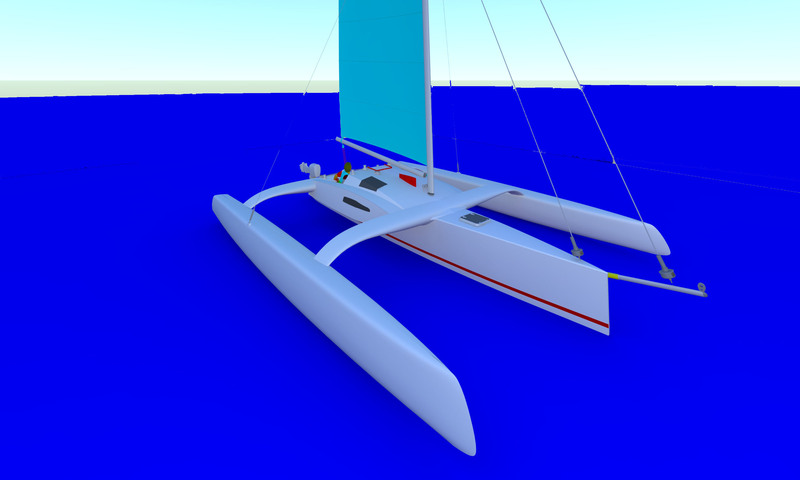 Another one in the last autumn wanted to power trimaran around the world. But the amas had to be hidden in harbor. I broke my rule about giving away too much free work because the project was interesting. 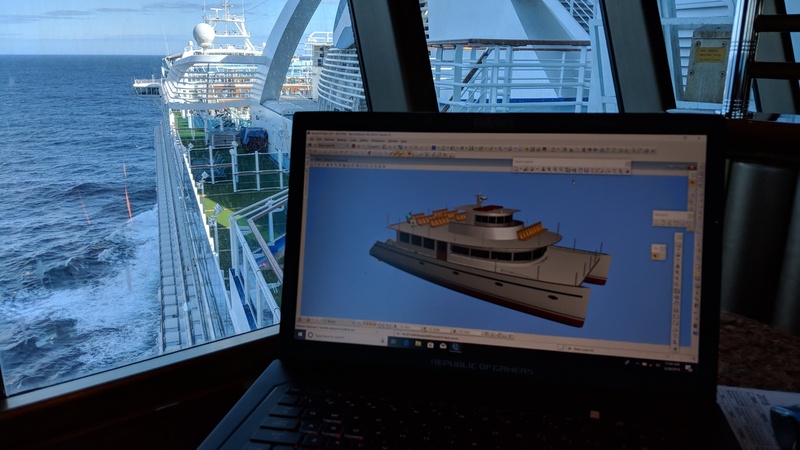 3D modeling was not in the scope of work and not paid for. I did it anyway. Closest I could come up with was sliding in at harbor. He wanted a very organic rounded look. Customer called up screaming that I was cheating him with work he didn’t authorize. I told him it was free. I never heard from him again. Picture is in mode. Former Skipper Chris Bane notes “I’ve logged over 240,000 nm on that boat. One of the best boats I’ve driven.” Chris has driven just about everything there is. I got another great picture of my 65′ Alii Nui. 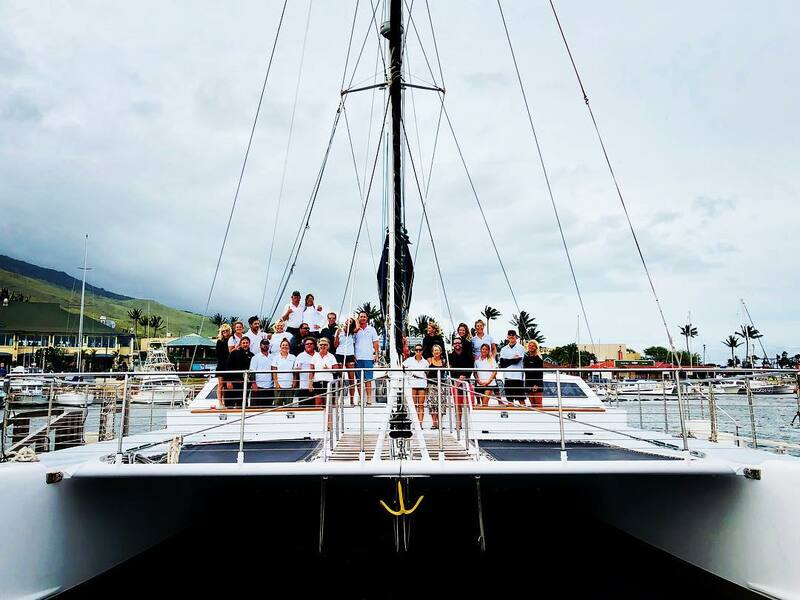 The queen of the fleet in Maui. My first time standing in the cabin. 50 feet, and 32 passengers. Building near Seattle. in my Automotive Design/Production magazine I read about a new composite being by the University of Portsmouth in UK. They are using a date palm fiber biomass for things like bumpers and liners. The products are reported to have better tensile strength and better low velocity impact strength. I get a bending strength of about 50,000 psi which is impressive. 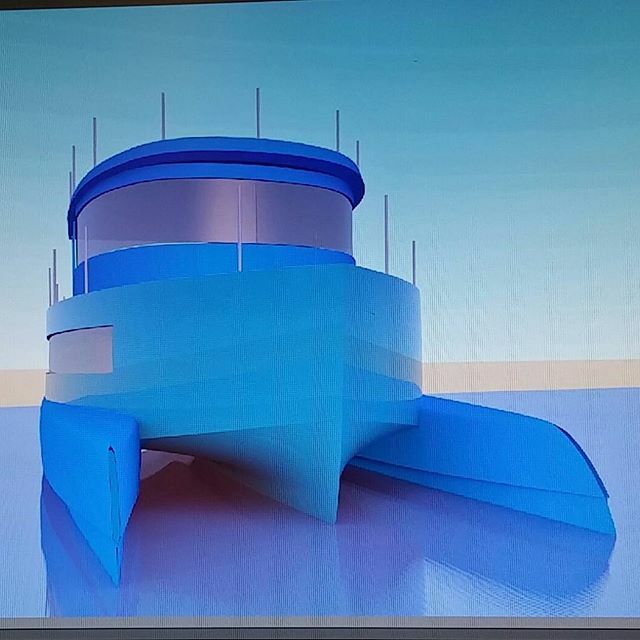 While it is obvious all the boat tech things that have gone into the lunar lander dwelling, several ideas from that spaceship have helped my multihull design. The first is a new view of lighting and interiors. My designs have always leaned toward vehicle and less to habitat. 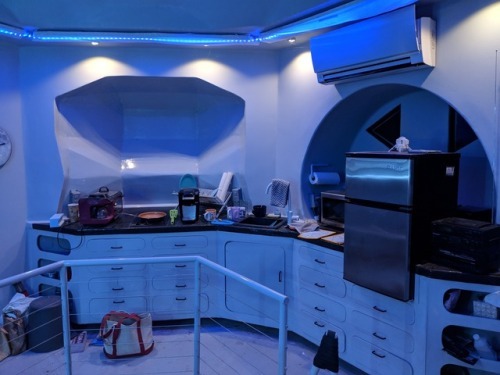 The interiors were flat white and throw in a few lights. The spaceship has allowed me to take advantage of the new design freedom allowed by all the new LED offerings. Another is the use of Foamular insulation foam for non structural core. 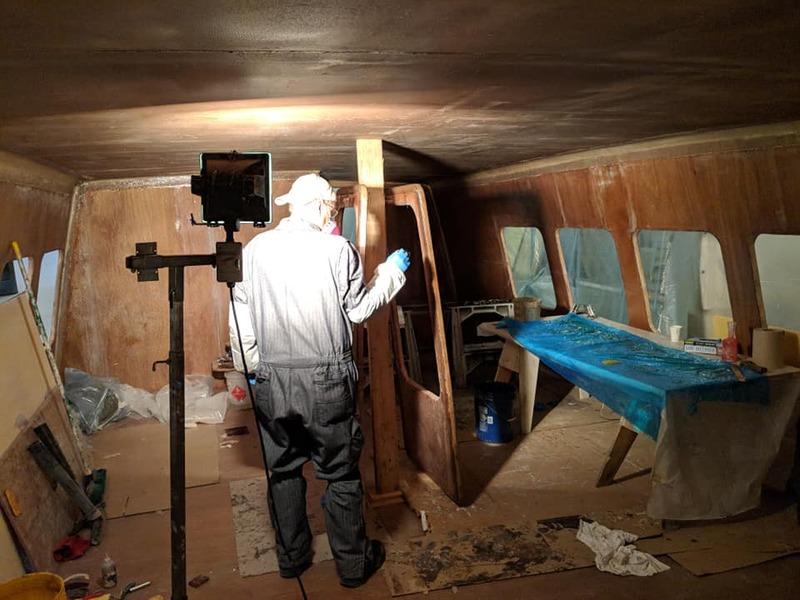 Things like shelves or seats can use a ply/core/ply sandwich with much less cost and much easier edge finishing than the usual Tricel materials. I read in my auto magazines that electric cars have their batteries punished by resistance electric heaters. Expect auto sized ductless heat pumps in a couple of years. I have been seeing the results firsthand at the spaceship. Energy costs are about a third of resistance heat. In development now. The beachable resort version first. 19′ x 8′. It will be vinylester/glass, not rotomolded. This arrangement is proven as it has sailed for years. I have been told that it can rotate 90 degrees each way from centerline. John Fanta would prefer Colligo Cheeky Tangs for the shrouds. 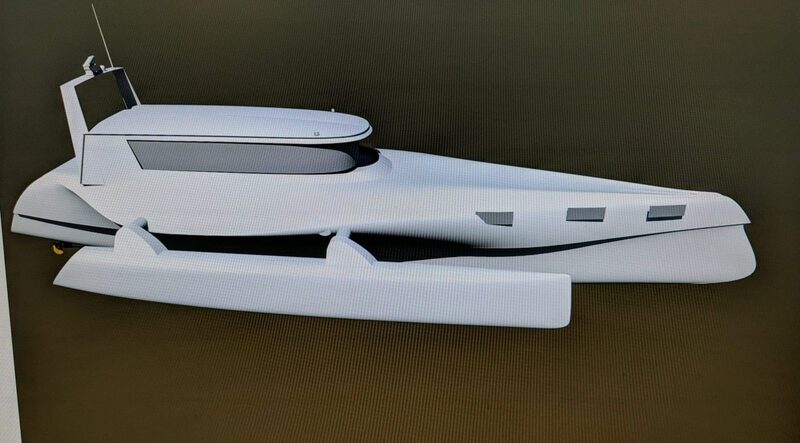 I was shown this 52 Mcconaghy trimaran with an interesting hound arrangement. 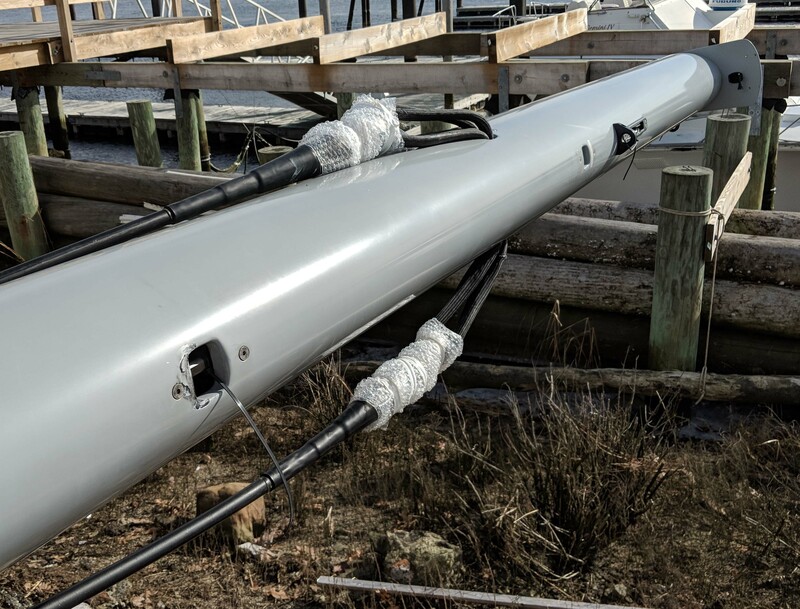 Composite rigging guru John Fanta advises against any hidden composite rigging arrangements. It also had an oddly large masthead plate and an oddly small and badly chewed up exit for something there in the picture foreground. 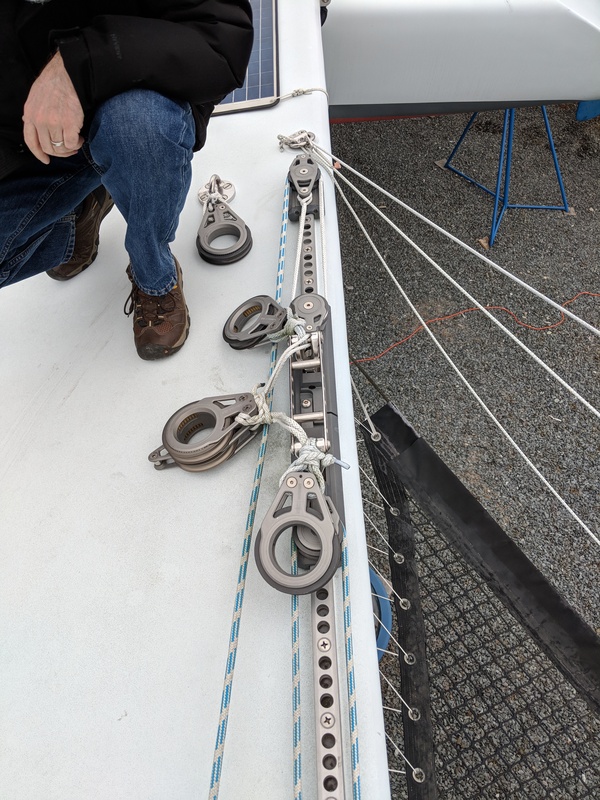 This is a pretty cool soft connection on a mainsheet car.